Given how popular YouTube is on the web, it shouldn’t come as a big surprise that a lot of people also enjoy watching video clips from their phones. 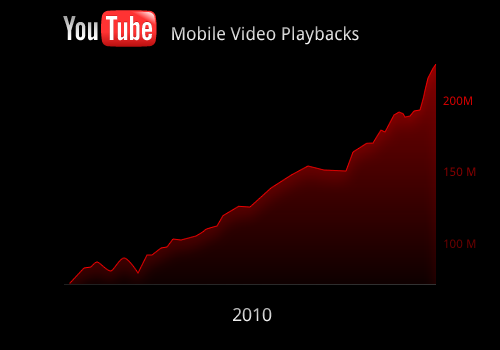 And, given the surge in Android, iPhone, and iPad sales, that adds up to a lot of videos. Today, YouTube is announcing just how much people are watching: a whopping 200 million video views per day, up 3x from January 2010. In addition to this stat, YouTube is also expanding its mobile content library — but only for its Android application. Beginning today, you’ll be able to watch official music videos through YouTube’s partnership with VEVO. This includes content from three of the big labels: EMI, UMG, and Sony, but music videos from Warner (the lone holdout on VEVO) isn’t available. In addition to the music videos you’ll be able to swipe through artist bios, other tracks by the same artist, and related artists. YouTube has offered access to these music videos from its web portal since VEVO’s inception, but they’ve been blocked on mobile devices for one big reason: content owners couldn’t monetize them. That’s also changing today, which is news that I’m sure comes to the chagrin of many. YouTube will now allow its content partners (including VEVO and thousands of other partners) to run pre-roll ads on videos played via YouTube’s Android application. The ads are 15 seconds (YouTube and the partners recognize that the experience is probably more painful on a phone than the web, so we probably won’t be seeing 30 second ads any time soon). And while they’re frustrating, they will boost the amount of premium content that’s available on the go. But why are music videos and ads only coming to the Android app? YouTube says that it views the Android app as a sandbox of sorts to test out new features. And it also has to do with technology limitations: YouTube’s HTML5-based mobile site is nice, but YouTube engineers need to find effective ways to monetize it (running pre-roll ads isn’t as straightforward there as it is using the Android native app).